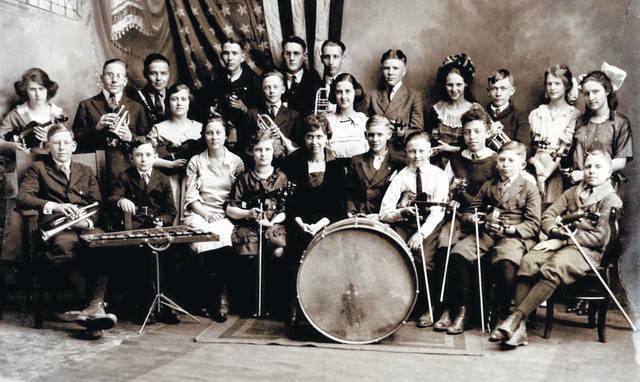 This photo is of the Children’s Orchestra, possibly taken in Cincinnati circa 1919-1922. Samuel Kaufman is in the front row, second from right, with the violin. Do you know of anyone in this photo? It is courtesy of the Clinton County Historical Society. The Clinton County History Center is now open Saturdays 10 a.m.-2 p.m. For more info, visit www.clintoncountyhistory.org; follow them on Facebook @ClintonCountyHistory; or call 937-382-4684. • Local meetings held recently included the 4-H Tractor Club led by Kenneth Terrell; the Wilmington Flying Club with president Scott Smith; the organizational meeting of the Port-E-Quers held at the home of Mr. and Mrs. Millard Ball, with Kenny Earley elected president; the Twin Pine Hustlers 4-H Club with president Jerry Dollar; and the Green Thumb 4-H Club with president Peggy Fawley.